Compared to Silicon Valley's finest, the world's second-richest man accumulated his vast wealth in a more conventional way. 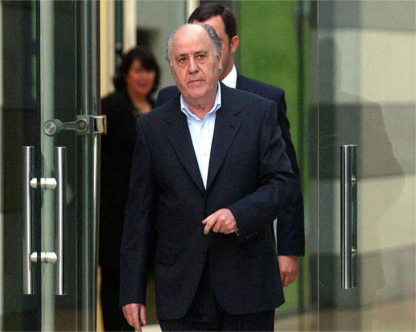 Amancio Ortega is the founder of Zara’s parent company, Inditex, and the head of a sprawling bricks and mortar fashion empire with 7,000 stores in 91 different markets. As a result, he has a net worth of £86bn. But his management style is far from conventional. We've rounded up some of his most surprising work practices, and while they won't guarantee success in your career, there are worse people to take work tips from. 1. According to people who know Ortega well, he has never had his own office, desk or computer, instead choosing to conduct business with colleagues standing in a design room for Zara Woman. 2. He is known for being an intense man - according to former long-term CEO of Inditex and Mr Ortega’s business partner for 31 years, José María Castellano, Ortega likes to have intense discussions with small groups. 3. Whilst most companies organise and discuss everything over email, Ortega prefers oral communication to written. 4. He delegates paperwork. Arguably one of the most annoying parts of any job, Ortega is in a senior enough position to delegate any paperwork he may have to his colleagues. 5. In a time when a lot of us spend more time talking than listening, Ortega has a rare trait - he makes sure to listen closely to people. He’s also known for being an introvert, shying away from public speaking or honours. 6. He keeps a low profile which lets Inditex’s other senior executives take centre stage. Ortega’s insistence on keeping business personal and close to home has turned out to be a crucial factor in his success: 55% of Zara’s manufacturing takes place in Spain, Portugal and Morocco, unlike the majority of big high street chains who outsource their production to Asia. This means that Zara’s shops can be refreshed with new stock twice a week, which is more often than many rivals. And since its flotation in 2001, Inditex’s share price has increased tenfold, putting it well above its competitors. Ortega’s personal wealth increases by €1bn every year, so if riches are your marker of success, it may be worth taking a leaf out of his book.